Mystery Fanfare: Hazel Holt: R.I.P. Sad news -- Hazel Holt: R.I.P. Hazel Holt was a leading crime novelist who wrote her first novel in her sixties. 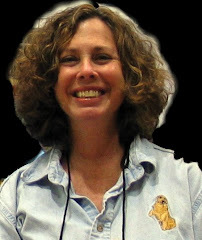 She is best known for her Mrs. Malory series. I hadn't know about the Barbara Pym connection, and I look forward to reading Ms Holt's Barbara Pym biography. It's with great sadness that we announce that Hazel Holt, author of the Mrs. Malory Mysteries, died on November 23, 2015. Hazel was a lovely person and an absolute pleasure to work with. Coffeetown has reprinted the first 7 Mrs. Malory novels, along with an original mystery, My Dear Charlotte. Coffeetown also reprinted several books by Barbara Pym. Hazel was her biographer and wrote forewords for these books, which she originally had published after Barbara died. She is survived by her son, Tom Holt, author of Lucia in Wartime and Lucia Triumphant (reprinted by Coffeetown). I love the Mrs. Malory books, which fortunately for me I have not yet read all of. I always felt Mrs. Malory was much like Hazel Holt herself, there is one book in which she is a literary executor as Holt was for Pym (another favorite writer). 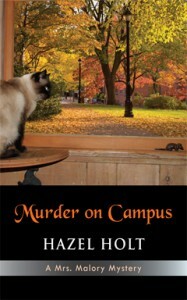 I started reading Hazel Holt with Death on Campus when I set out to read all the academic mysteries I could find. She told it like it is, and I love that she surrounded the murder with a community of friends and suspicious others. Thank you for your announcement! What astounds me is that I could not find one obituary for Holt in any of the British papers! But considering that she was executor of Barbara Pym's literary estate, I expected to see something in The Guardian, at least. (Perhaps my Google skills are lacking?) I, too, was caught up by her mysteries set in academia, and became a fan from then on. Sad news. Yes, I was surprised, too, Ann, that none of the British papers carried the obit. Perhaps we will see something soon. Rather late - but just seen this and very sad at the news. And also sad that there will be no more Mrs Malory books. She was a detective I would like to have known - and that is a very good sign! Also, an intelligent woman, not a fluffy type (all too often female detectives rely on men to tell them what is happening). An academic who wore her knowledge lightly, a sense of humour, and grounded in her community. What a wonderful creation! Thank you for your comment. I am Hazel's granddaughter and as it is just me and my dad left in our family, we were too overwhelmed by her passing and the funeral arrangements etc to think of putting anything in the papers. So very sorry, Natalie, for your loss. Very sad news. So sorry for your loss Natalie. This is sad news, indeed. I always looked forward to starting a new Mrs. Malory story, & sad at the mystery's conclusion, as this particular series is one of my absolute faves. Condolences to her family & friends on Ms. Holt's passing. I am hoping that Hazel Holt's granddaughter will see my message. These books have been wonderful and had such a positive impact for myself and my Mother. I began reading them when she did, mostly to have something to share and discuss. She is now 85 years old. When her memory problems were just starting, I was traveling to London for my work. We read these books, and I used them as a way to share my experiences with her. Especially the food discussions, teas, scones, and Devonshire clotted cream. LOL. They have brought us much joy and a unique opportunity to stayed connected. I just learned of Hazel Holt's death. She was one of my favorite mystery writers. She was a favorite to take backpacking with me. I've read all of her books three times. The only other person I can say that about is Agatha Christie. I didn't realize she started writing in her 60s. Me too, mostly. Gives me hope! By the way, she is one of my main inspirations for my own writing. I think she was one of the all time bests. My deepest condolences to Natalie and to Hazel's son. I am sad to tear that my favored author Hazel Holt had past away. My condolences to her son Tom and granddaughter Natalie. I first find her book Mrs Malory in a cabin in Iceland, were I was hicking and love the story and wanted more stories from Mrs Holt. But they were rare in Iceland so when ever I was in England I looked for them and tried to Oder them on line but I haven't got them all sadly. So sad that dear Hazel has gone to the next world. I first learned of her through the Barbara Pym Society; we were in touch by a few letters and by telephone. I love her books and have them all - she even gave me two as presents. Sheila Mallory, for me, lives on. She represents a better, more civilised England; but Hazel had a brilliant, incisive mind, made evident in her books. I am a Catholic bishop and will offer a Requiem Mass for her soul, only now having learned of her death. Thank you Hazel, and all my love. Thanks for leaving such comforting words. Hazel Holt was very special. Hazel was indeed special. There had been no mention in our British press, so I never knew of her death till now. Do you know how I might contact her son Tom? Do please email me if so. Or feel free to email me anyway. I am in London. Sheila will keep me entertained for years to come. While it is sad we shall have no more Hazel Holt books (which was the last one? I am hoping there is one I have not yet discovered!) Sheila Mallory does live on because she is such a wonderful creation. Someone we wished we knew, but we can revisit her in the books - mine are getting somewhat worn due to my re reading of them! A safe haven when the world is getting increasingly confusing. Bless you, Hazel. There are still several of the more recent Mrs. Mallory mysteries I haven't read. My friend who was from England and I used to share them. My friend passed away last year. We enjoyed the day to day details of Mrs. Mallory's life as much as the mystery itself. It is my fantasy to live in a little village in England. Mrs. Holt made me feel like I was right there with Mrs. Mallory. Thanks, Nannette, for sharing. So sad.. Sorry about your friend. I have thoroughly enjoyed reading Hazel Holt's novels since discovering them in my local library this year, and I was sorry to learn of her passing. It is rare today to find crime novels which are written in a way that avoids the endless graphic violence we are exposed to in fiction, and sadly, in life. These gentle stories, containing at their heart the question implicit in a whodunnit,take the reader to another time, and evoke a feeling of peace and security, in spite of the subject matter. The character Mrs Mallory is up there with the best of British detectives, dogged in pursuit, and always triumphant. I wish I had found her creator earlier.